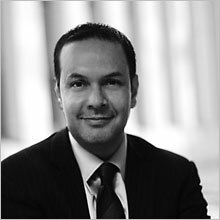 Raúl Pérez is a partner with Capstone Law. His practice focuses on complex litigation, including consumer and wage-and-hour class actions. Over the course of his career, he has represented clients in several jury trials and arbitration hearings involving multi-million dollar disputes. Raúl successfully negotiated court-approved settlements in dozens of class actions totaling over $50 million. Raúl received his training in labor and employment law at Morgan Lewis & Bockius, and went on to work for several other prominent firms as an associate and partner, where his practice included defending toxic tort claims and representing several entertainment companies and artists. Raúl also served a six-month assignment as Assistant to the Special Interim Legal Counsel to the City of South Gate where he was part of a legal team assigned to restore integrity and good government to the scandal-plagued city. Raúl graduated from Harvard Law School (’94) and received his undergraduate degree in Government from Harvard University (’90). Raúl was also a Senate Fellow for the California Legislature in 1991. Raúl was recently recognized as one of the winners of the 2015 California Lawyer Attorneys of the Year (CLAY) Awards for his work on Iskanian v. CLS Transportation Los Angeles, 59 Cal. 4th 348 (2014), a high-profile ruling from the Supreme Court of California that preserves the rights of employees to pursue wage claims in court under California’s Private Attorneys General Act of 2004, rather than through arbitration. Raúl is admitted to practice in California and before the United States District Court for the Northern, Eastern, Central, and Southern Districts of California and the United States Court of Appeals for the Ninth Circuit. He served as a Commissioner for the Los Angeles World Airports, and for the Los Angeles Fire and Police Pension Board. Raúl is also the former President of the Latino Lawyers Association. In recent years, he has served on the board of Padres Contra El Cancer, the Latino Theatre Company, Girls Inc., and the Chicano Latino Youth Leadership Project. He is currently on the Board of Advisors for the Banc of California and the Hispanic Scholarship Fund.